It’s Wine Down Wednesday! – Allons-y Craft! …and by ‘wine’, I mean vodka! …and by ‘vodka’, I mean flavored vodka! 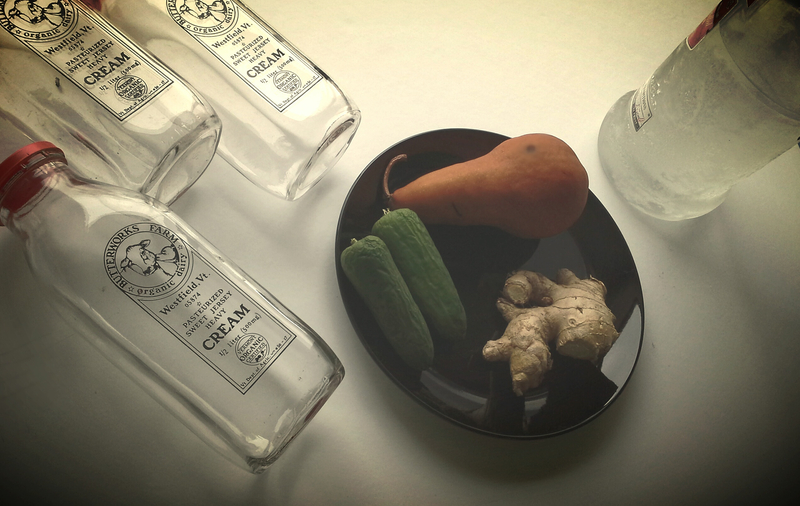 …and by ‘flavored vodka’, I mean DIY infused vodka! We’re making vodka! And no I haven’t had any…yet! I’m so excited for this one, no real reason why other than it involves these awesome milk bottles I found at a local vintage shop, and well, the vodka part! Get ready to impress your friends at your next cocktail party or put other guests to shame with this fabulous host/hostess gift. Full how-to after the jump. My booze ready to infuse! The flavors I’m using for my vodkas are jalapeño, ginger, and pear. Jalapeño – for bloody mary’s, ginger – because I’m obsessed with ginger in drinks right now, and pear – well, because I had one left over. But it’s not rocket science – you like it, put it in the vodka! Herbs, berries, citrus, vanilla – go for it! Experiment! It’s all a part of the fun! I cut 2 jalapeños and removed the seeds for flavor 1, peeled and cubed 1/2 a pear for flavor 2, and peeled and cubed a piece of ginger for flavor 3. Store in a cool dark place (kept mine in the fridge) for up to a week, shaking a few times a day (pretty much any time you open the fridge works). I say up to a week, because some items may not need that long (berries and citrus) and you can always do a taste test about every few days in to see how the flavor is doing. When it’s ready, strain into another container to remove the infusing ingredients. If you want to use the original bottle, make sure to clean it thoroughly first before pouring the clean vodka back in. It should last in the fridge for about 2 months in an airtight container. Next week I will have some yummy recipes for you all! Thirsty Thursday, anyone? I’m totally here for infused liquor! I have a vanilla bourbon and a cucumber/pineapple gin chillin in my fridge as I type. Ha! You have to let me know how those turn out! I normally stay away from gin and bourbon but those flavors sound delicious! Previous Previous post: Monday Morning Blues…and Rock, and Pop! Next Next post: On the Road Sneak Peek!